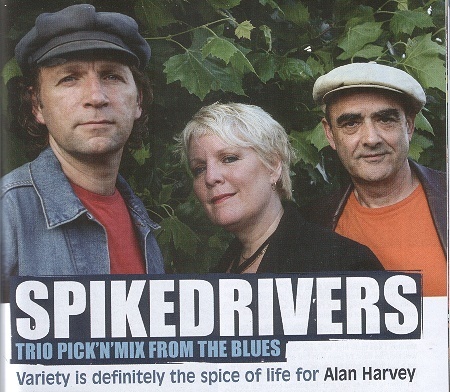 Coupling unique instrumentation with exceptional musicianship and alternative reworkings of over familiar classics with fresh original songwriting has seen the Spikedrivers outshine many a headliner at a British Blues festival-and made them a live drawer across the country. 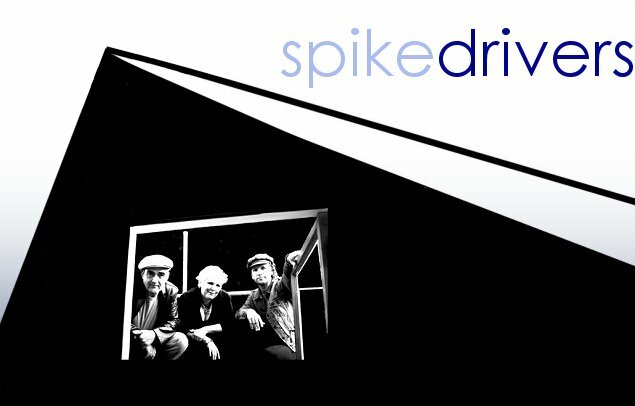 Ben Tyzack (guitar/vocals/harmonica), Constance Redgrave (bass/vocals/percussion), and Maurice McElroy (drums/vocals/percussion) draw upon all their years of experience to offer one of the more compelling live experiences offered by any British Blues act. 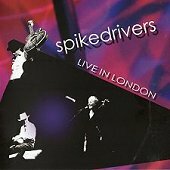 Despite their veteran status and constant touring, the Spikedrivers continue to challenge themselves-and the their audience! BM: Ben, when did you form the Spikedrivers? Ben: The original band was formed in March 1992 with myself, a percussionist called Chang and a double bass player called Mark Harding. That went on for a few years, different players came and went, and then I met these guys. Ben: Like most Blues groups, you get deps and Maurice had filled in once. He thought we didn�t like him because we didn�t call him again for a couple of years, but it was a fantastic gig. Then years later I needed a dep bass player. A mutual friend had told Maurice and Constance to come and see a gig. It turned out Constance and I had already met not long after we both got here-the UK. Maurice: Yes, there was. I was house drummer for a Blues jam at the World�s End, Finsbury Park, so what we did was to all turn up there and I got Earl Green to put us up together to see how it went. It just worked and felt right. Was it more of a Ben Tyzack Band then? Ben: I think it�s always been a group of musicians with a main songwriter/singer, but I�ve always wanted to have a collective energy of contributions from everybody. Constance and Maurice, you both previously played with Otis Grand. Was that at the same time? Maurice: I was there first. We knew each other from the Wes McGhee days. I�d been with Otis about two years and got a call from Constance saying �I wanna start playing the Blues and people say I should talk to you�. So I invited her down to a Blues jam and she started coming to some of Otis� gigs. I split from Otis in 1996 and Constance and I started a band called Misdemeanour. We played a gig in Portsmouth, on the same bill as Otis. Not long afterwards, the phone rang at her house and she was off. Constance: I did that for about three years. Towards the end there was a bit of overlap, which was a bit tense, but I couldn�t walk away from Ben-I was having too much fun! How easy was it to move from an electric Blues band into Ben�s more acoustic, rootsy environment? Maurice: We�d all done a lot. I�ve played with Otis Grand, in the theatre, soul music and the Irish scene. You each have different musical and cultural backgrounds. How does this help to dictate the band�s musical direction? Constance: I�m a West Coast girl and Ben and I are both prog-rock kids, so there�s a sound that we grew up with: the harmonies of The Beach Boys and Crosby, Stills & Nash. Maurice: We listen to a tremendous variety of music in the car, from heavy rock to jazz and film soundtracks. I�m a big flamenco fan, which is how the cajon and udu drum have ended up in our sound. Ben: With the internet now, you don�t have to have grown up in an area to fall in love with a certain type of music. The title of your first CD together, Delta Roots, paint a picture of the Spikedrivers sound. Your music is much more varied, though, so how would you classify it today? Ben: It�s hard to pick one work or phrase. The words that keep coming up on the website�s guestbook are atmosphere, emotion and soul. They don�t describe the genre, but definitely what we�re trying to put across. Keeps your audience interested for an hour and a half..
Maurice: Yes. I know if I go to a concert I get bored pretty quick if the music is very linear. It doesn�t matter how good they are, there is a limit to how long you can handle the same thing. As a Blues drummer, when depping, I�ve spent entire evening doing swing shuffles-you suddenly wonder where in the set you are! That doesn�t happen here. Do Ben and Constance�s American roots lend an extra layer of credibility to your status as Blues artists in the UK? Ben: It�s something promoters pick up on, but we�ve been together seven years now so it�s not something that� really going to promote it. Hopefully the music now promotes itself. Does having three songwriters create any problems? Ben: Obviously, I�m the main songwriter in the band. Constance has written songs for some time; Maurice is fairly new to it. There�s space for everybody and combinations where we write together, which makes everything stronger. Constance: It keeps the variety. How does the management of the band work? Do you all have specific roles? Maurice: Ben handles the actual gig work; I do the PR. Constance: I do the money� It�s a business. Maurice: Sometimes the business-side is tedious. Ben: If we�re going to have a rehearsal we don�t have a meeting first, otherwise it just disappears time-wise. You have to a bit discipline. We�ve talked about getting management at points, but we don�t need that. Maurice: You have to think, what would they have to do to make it worthwhile and so far we haven�t seen anyone who�s able to deliver what we would need. Constance: Also, we were allowed to find our own way. We�re involved and create what we create. Every album is like a snapshot of the time. Do you all have day jobs? 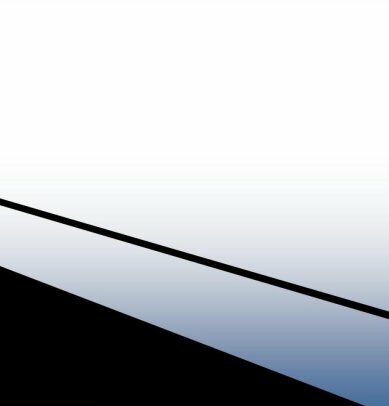 How hard is it to balance work and family demands? Constance: We do, but this is the priority. Ben: We have flexibility. There are periods of the year when we�re quite busy. Working five nights a week doesn�t appeal to us because you just wear yourself down and you�re not keeping the quality of performance. Are you all permanently wedded to the Spikedrivers now? Maurice: Yes, we�re nearly ten years together now. You can�t dep it. If any of us doesn�t show up, the gig doesn�t happen. Constance: It�s too unique what each of us brings to the sound. I�m not going anywhere! Maurice: When we started, we thought we�d give it a year, now here we are and it�s still just rolling on. Ben: Very important. Having a common sense of humour, right from when we first met each other, was as important as the music was. When you�re travelling around a lot you need a sense of humour. How do you get the right balance between this and the serious-side of the music? Maurice: Humour is another emotion that goes along with the sadness, anger or whatever you�re putting into a song. There�s humour in the music, but it�s not comedy. That�s just looking at the way the world works. We�ve all got to the point where if you make mistakes it really doesn�t matter. Constance: That�s where happy accidents help creatively. Ben: On the one hand, you�ve got to think that this is so important and serious, but on the other hand, it�s a completely nothing thing that you can just throw away. Constance: Because I don�t play guitar, most of my songs come out of pictures in my head and I write some strange poetry. Then I put it to music. I take everything as far as I can then bring it in and we work out an arrangement for it. Maurice: Again, I don�t play a melody-line instrument, so I sit down and sometimes I�ve got a line to spark me off. Then I�ll get a rhythm in my head, then work through the lyrics, then I bring it in� I�m still learning. Ben: Mine is a variety of things. A lot of it comes from the guitar or writing lyrics first. Some of the fun ones are when things cross over, such as Two Left Feet coming out of Constance turning up for a gig with two left shoes! Maurice: It feeds the brain. It�s that simple. We figure if you�re a musician you�re an artist and you need to be inspired and things that feed your own creative energy. Constance: Painting, writing, photography, architecture, all of them are expressions of you. That�s what being an artist is. It�s taking an emotion and somehow finding a way of expressing it. I think they�re interchangeable; they�re all like different languages that you can dip in and out of or combine. �Gypsy Wind� started with a picture of something that happened in the Nevada desert years ago and we were in Orkney and I just thought, �that�s where the story goes�, it made sense to me. Then it�s how you paint these pictures with words and music. How important is playing live to you? Ben: We all go a bit wobbly if we don�t play. If we have a break for two or three weeks I get this cloudy feeling, not sure exactly what it is, but then we�re the van on the way to a gig and I get so excited. You still get nerves presumably? Constance: Excitement and fear are two sides of the same coin. You learn how to stay the right side of that line and take that into the show. As soon as the first note�s played we�re fine. Ben: Playing to an audience that�s appreciative is like a drug. Constance: We can�t do it without them. Ben: It�s a kind of reassurance. These people are enjoying it; now I know why I�m doing it. Maurice: Particularly when, as we do, playing to an audience that�s knowledgeable about music. You know you�re not gonna get away with it if you start faking it. How many �instruments� do you have on stage for gigs? Maurice: If you look at basics it�s a minimum dozen. If you start counting all the bits of percussion and Constance�s box of tricks you�re getting somewhere near thirty-five. Constance: And in the studio there�s all the other bits as we�re limited by only having two hands and a mouth. Ben plays four different guitars on a gig. Some people may thing that�s excessive, but they�re completely different sounding guitars and the tuning for different songs is completely different. Getting on a plan is a little bit hard for us� but we do it. Tell us about the workshops you run. Constance: Love �em, grown-ups down to four year olds. Maurice: It came out of a charity thing. Ben: There�s that and a school in Ascot asked us if we would do one. We did a big Arts Week thing in Kilburn for little kids. Out of that the school asked us if we would do one and if we would add a bit of history to throw an element of education in there. It was a challenge for us and it�s kinda grown since then, but that was the basis of the Blues Workshop in Kilburn and it seems to work for every age group. Constance The song writing is a new one, but again because somebody asked for it so we created it and it works. It�s very buzzy. Ben: We had it listed and somebody called our bluff basically!! Maurice: What I found was that when you break down rhythms and things like that to put in a form to communicate to somebody else can sometimes teach you something that you�d never thought about because it might be you just did it instinctively. Breaking it down sometimes makes you realise what it is you�re doing. Ben: The energy of the kids and seeing them enjoy themselves and seeing them create, and the questions they ask us are just priceless. Someone recently asked us if we could do a performance and a workshop in one night. It was in the Maltings in St. Albans. It worked really well and tied the whole evening together and we brought the workshop in at the end as well to get people on percussion. How come it took you guys so long to get to the release stage with the live CD? Maurice: The CD was finished quite quickly; the problems were with the DVD. We don�t know what they were but the High Barn put in a lot of work to try and solve them. In the end, they felt that, from a technical point of view, it wasn�t good enough to release. Knowing you were being filmed/recorded for this release, did this change the dynamic of the performance at all? Ben: On the night, I tried not to think about it at all and just play. However, the work we did leading up to the show was one of the most interesting and rewarding processes that we have gone through. I must admit it was a challenging process. We slowly started changing and adapting what we did on stage, sometimes quite small things. Over a period of time it really transformed our show-it has really helped us. Constance: Absolutely! I think it demanded that we really raise the bar line and we do like a good challenge. We spent some rather uncomfortable time watching all of the live footage that we could find; analysing and observing what worked and what didn�t. We stopped doing gigs and started doing shows. It sounds simplistic but that was really where the dynamic change came in. What you call something really defines. It. Maurice: Yes! Most DVDs are filmed over two or three nights. We had one. Suddenly we had to start thinking about how we looked, how we moved, how we used the stage. We put a lot of work into all those elements before the filming and adrenaline levels still went through the roof. Constance: Absolutely. For an old-fashioned analogue style band, the technology was a sharp learning curve for all of us. None of us even owned a 5.1 system prior to this. Working with new people, in a new place and a new way. Trying to understand how DVDs and CDs are made these days with computers and then how the sound is combined with the visuals. It was definitely worth it. I thing the end result captures that wonderful Barn sound and our performance on the night well. And don�t thing we have given up on the DVD idea. We are working on plan B.
What�s next for the band? There was talk previously of compilation, studio and soundtrack albums, which I guess have all been put on hold whilst you finalised the live release. Constance: The sheer volume of things we want to do in this band continues to astonish me, even after eight years, and long may it continue! It�s been hard having everything on hold. I expect a minor explosion over the next two-years. What are your hopes for the future of the Spikedrivers? Ben: There are areas of Europe we haven�t played. Constance: I want to play in Japan. Maurice: We would play anywhere! Ben: It�s a live performance thing. Without people turning up it wouldn�t matter how many ideas we had. It�s so important for people to keep going out, as otherwise venues will close.